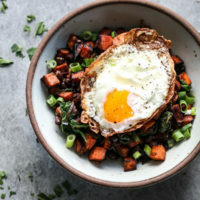 This Sweet Potato Black Bean Hash Recipe is kicked up with Mexican spices. It's Whole30 friendly, paleo, and gluten-free. Perfect for a quick breakfast with an egg on top or easy dinner as a vegan taco filling. In a large non-stick skillet, heat the olive oil. Cook the potatoes over medium-high heat, stirring occasionally, until brown and tender, about 15 minutes. Turn the flame down if they begin to blacken. Add the shallot, black beans, salt, cumin, and chili powder. Sauté 3 minutes more, until the shallot is soft. Carefully fold in the spinach and cook until wilted. Drizzle with the lime juice.